With this sort of background and lineage, it isn’t too surprising to learn that young Ferrante began picking out melodies on the piano at the age of 2! When he was but 5 years old, he began his formal music study with a private teacher, who insisted that the child concentrate on sol feggio for three months before allowing him to touch a note on the keyboard. A scan eight months later, the tot played in public for the first time in a student recital, when he performed the First Movement of the D Major Concerto by Haydn and Für Elise by Beethoven. A year later, Mama Ferrante insisted that the boy begin his study of complete music theory, and Art was given a test for the Juilliard Preparatory Center. The result of the test so amazed the examining board, that he was awarded a full scholarship to Juilliard—which continued until he was 21! During his years at Juilliard, Ferrante won every award the famed school had to offer, including the Loeb Memorial Fund Prize, the coveted Coolidge Chamber Music Award for Composition and many other distinctions for all phases of his studies. Unlike his partner, Ferrante, Louis Teicher had no musical heritage to claim for his own great talent. His brother and sister showed signs of an interest by studying for a time, but neither displayed the unusual gift which he possesses. The Teicher precocity became evident when he (like Ferrante) started his piano performing at 2, picking out familiar melodies on the keyboard. Two years later—at 4—he began his piano studying under private tutelage in his home town of Wilkes-Barre, Pennsylvania, and continued thus for a year. Brought to New York for the Juilliard Preparatory Center test, he was hailed as a prodigy and was granted a full scholarship, which remained in force until 1945. So impressed were the faculty heads with his talent, that they made arrangements for him to attend grammar school for a half-day only for the whole of his elementary schooling years, arranging for whatever private tutorship seemed necessary. His progress in the Juilliard school was so remarkable that he was graduated at the age of 15—one of the youngest students to have finished the curriculum in the history of the institute. During his course of study, he received the Schirmer Gold Medal for Highest Musical Attainment, one of the most coveted honors bestowed at Juilliard. In the Fall of 1944, Teicher became a post-graduate as a conducting major and was appointed to the faculty to instruct in theory. He continued in this capacity until October, 1947, when he made his appearance with Ferrante as duo-piano soloists with the Toledo Symphony Orchestra, and the team was roundly acclaimed. At the beginning of his post-graduate work in ’44, Teicher accepted the offer to play in the pit orchestra of the Broadway his musical, Song of Norway, playing all of the solo piano passages. Noting the value of popular music long before this, he also headed his own piano-violin-cello trio at the exclusive Ritz-Carlton Hotel, where he was able to experiment with his own ideas and theories in embellishing the pop form. In January of 1948, he teamed with Ferrante for the permanent association that has distinguished them as the most outstanding and unique duo-pianists of our time. While the trends, styling and patterns of music may undergo changes from time to time, there have been relatively few new instruments which have made their appearance to introduce new sounds in the over-all orchestra scene. True, the recent application of electronic amplification and attachments have made somewhat of a difference, but, on the whole, there has been nothing unique or startling in the form of innovations for instrumentation. That being the case, the two gentlemen who are featured in this album could be considered pioneers of a sort. Ferrante and Teicher have, for the past decade or so, gone so far beyond the ordinary limitations of the eight-eight keys on the piano, that their listeners often gain the impression that they predominate in a gigantic orchestra comprised entirely of Ferrante and Teicher inventions in all the families of string, woodwind, brass and percussion. Let us make a fact quite clear about his album, therefore: This is the very first time these titans of the keyboard HAVE resorted to using instrumentation and musicians other than their own two Steinways and their own hands and digits… Despite the fact that many Ferrante and Teicher followers (and they are legion!) have assumed that they were employing standard scoring for a percussion section, this is actually the first series of recordings in which they have resorted to the use of such a group. Like their previous outstanding work on record, however, the four additional musicians have been included to assist F. & T. in the team’s never-ending “exploration into sound.” You will note that the supplementary group offers an additional expansion of the Ferrante and Teicher realm of musical uniqueness. 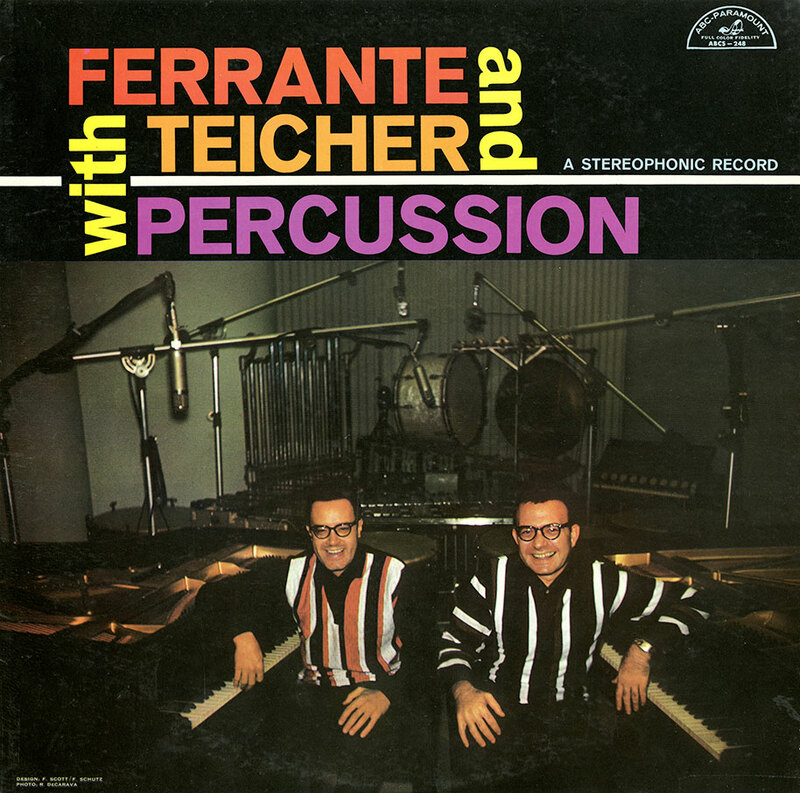 Naturally, all arranging and scoring is accomplished by Ferrante and Teicher themselves, and the same rule held true for this album where the percussion section was included. You will truly relish this journey of your own exploration into sound. "How High The Moon," "Beyond The Blue Horizon," "Cielito Lindo (Ay, Ay, Ay, Ay)" and "Va Va Voom" were reissued as bonus tracks on the CD reissue of Blast Off!